Summary: A patient with Takayasu arteritis with multiple supra-aortic lesions underwent successful treatment with two-staged stent implantation. Stenotic bilateral common carotid, innominate, and left subclavian arteries were dilated, and no restenosis was observed during the follow-up period of 2 years despite recurrent inflammation. Stenting for supra-aortic vessels in cases of Takayasu arteritis has rarely been reported, and to our knowledge, this is the first report of multiple stent placement for all the supra-aortic branches involved. 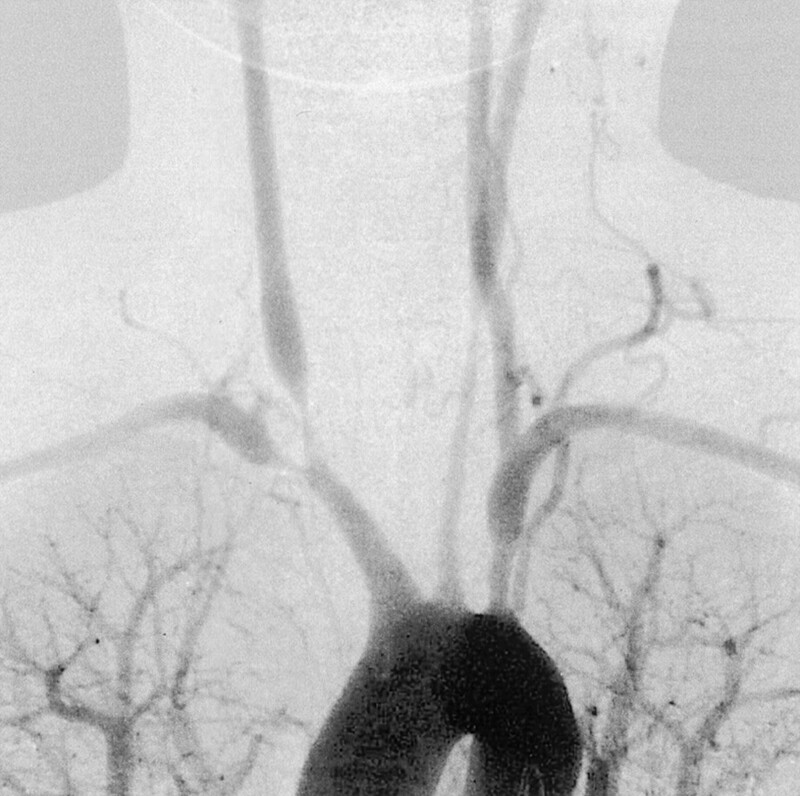 Takayasu arteritis, an inflammatory disease of unknown origin, frequently affects major supra-aortic vessels and causes many symptoms, including brain and retinal ischemia (1). During the last decade, percutaneous transluminal angioplasty has been reported to be effective for releasing the stenotic lesions in this disease; however, the rate of restenosis has been found to be much higher than that associated with atherosclerotic lesions (2, 3). Recently, stent placement has emerged as a reasonable alternative for the treatment of vascular stenosis, but its effectiveness in inflammatory lesions is still not clear, especially in carotid artery lesions. We herein report the case of two-staged stent implantation in a patient with Takayasu arteritis that involved all the major supra-aortic branches, together with the clinical and angiographic 2-year follow-up data. A 29-year-old woman who was experiencing frequent fainting attacks was referred to our clinic in February 1999. She had first complained of neck pain 2 years before, and multiple stenosis of supra-aortic vessels had been detected by angiography at a previous hospital in May 1998 (Fig 1). Takayasu arteritis was suspected, but the patient had been under observation without steroid use because of minimum inflammatory signs revealed by laboratory testing. At admission, the patient was suffering from frequent attacks of unconsciousness and transient right visual disturbances. 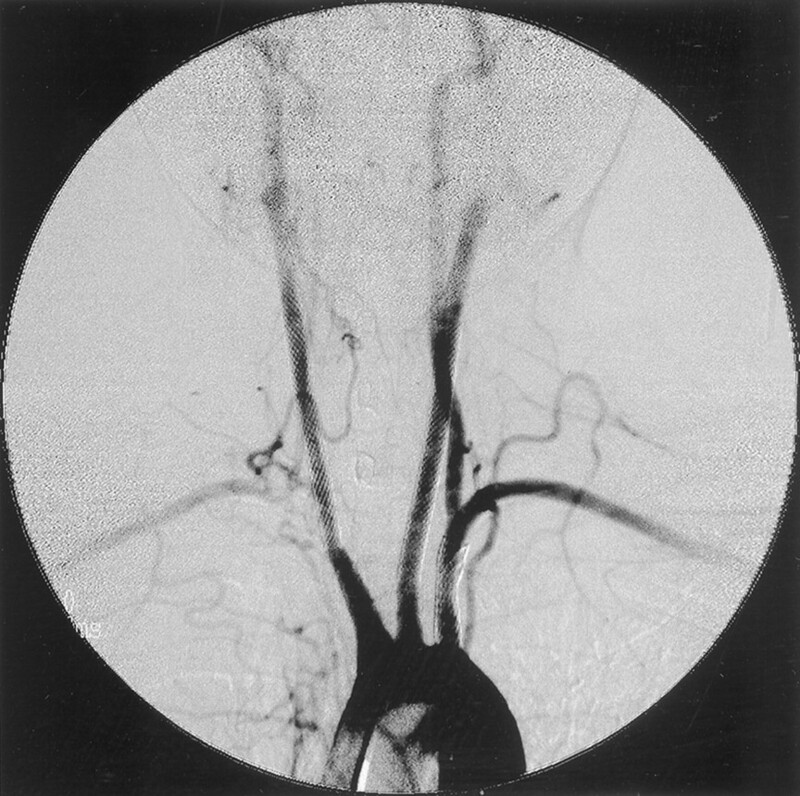 Bilateral radial arteries were not palpable, and retinal microaneurysms were found in the right eye, indicating chronic retinal ischemia. Serum C-reactive protein was within normal limits, and MR imaging showed no cerebral infarction. Angiography revealed multiple stenotic lesions in the supra-aortic vessels (Fig 2A), which had apparently progressed during the past 1 year. The right innominate/subclavian artery was severely stenotic and was totally occluded just proximal to the origin of the vertebral artery (Fig 2B). Although the right common carotid artery was poorly visualized on the aortogram, selective catheterization showed that it was barely patent and that the internal carotid artery was occluded at the carotid bifurcation (Fig 2C). Blood flow to the right cerebral hemisphere was supplied by the collateral channel, mainly from the vertebrobasilar system. The left common carotid and subclavian arteries were also stenotic. With all these findings, a diagnosis of Takayasu arteritis was made. The frequent fainting attacks were considered to result from carotid sinus hyperreflexia. Because these attacks presented formidable impediments to the patient’s daily life, intravascular treatment was performed with informed consent. Angiogram obtained 1 year before admission. Stenosis of the bilateral common carotid and subclavian arteries is noted. Angiograms obtained at the time of admission. A, Arch aortogram shows deterioration of all the supra-aortic lesions. 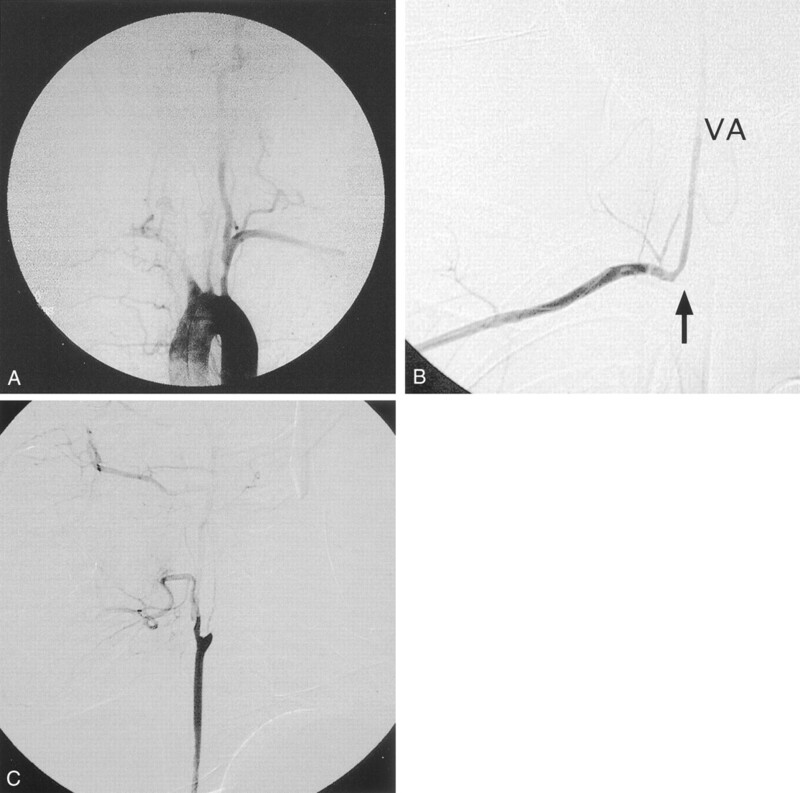 B, Transbrachial angiogram reveals that the right subclavian artery is totally occluded (arrow) just proximal to the orifice of the vertebral artery (VA). C, Right common carotid artery is poorly visualized on the aortogram, but selective catheterization reveals its patency and occlusion of the right internal carotid artery. To prevent drastic changes in cerebral hemodynamics, a two-staged treatment was planned. With the patient under local anesthesia and receiving systemic heparinization, an 8-French guiding catheter was placed in the aortic arch via the femoral route and a 30-mm-long Palmaz stent (Johnson & Johnson Interventional Systems, Warren, NJ), mounted on a 7 × 40 mm percutaneous transluminal angioplasty balloon, was deployed at the stenotic lesion of the left subclavian artery. 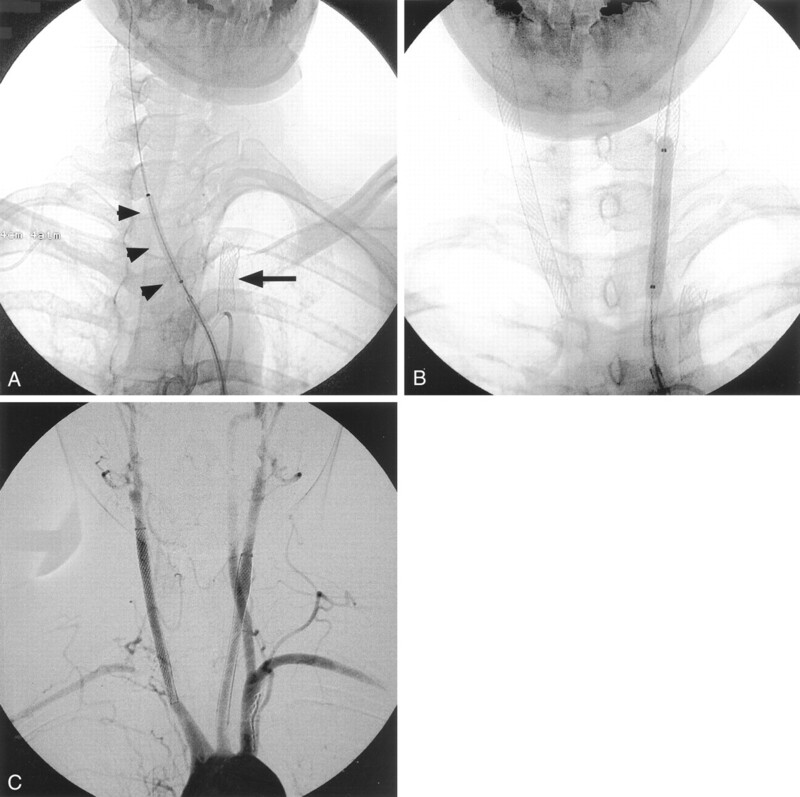 Subsequently, the guiding catheter was placed in the innominate artery and the proximal portion of the right common carotid artery was dilated with a 4 × 40 mm percutaneous transluminal angioplasty balloon (Fig 3A), which markedly improved the antegrade flow of the right common carotid artery. Because the long-term outcome of carotid percutaneous transluminal angioplasty, with or without stent support, was not known for inflammatory arteritis, we did not use stent support for the common carotid artery lesion during the first treatment. Ticlopidine hydrochloride (100 mg/day), cilostazol (100 mg/day), and prednisolone (5 mg/day) were prescribed. One month later, the second treatment was performed. After aortography, which revealed no restenosis in the previously treated lesions, a 9-French guiding catheter was placed in the innominate artery and an 8 × 50 mm self-expanding Easy Wallstent (Boston Scientific, Natick, MA) was placed from the right common carotid artery to the innominate artery. The guiding catheter was then placed in the aortic arch, and an 8 × 50 mm Easy Wallstent was deployed in the left common carotid artery. Dilation was then achieved with a 5 × 40 mm percutaneous transluminal angioplasty balloon (Fig 3B). Aortography performed after all these procedures showed sufficient revascularization of all treated vessels (Fig 3C). No embolic complications were detected by MR imaging throughout the therapeutic period. Two-staged stent implantation for multiple supra-aortic lesions. A, First treatment. A Palmatz stent was placed in the left subclavian artery (arrow), and percutaneous transluminal angioplasty was performed for the right common carotid artery (arrowheads). B, Second treatment, performed 1 month after first procedure. An Easy Wallstent was placed from the right common carotid artery to the innominate artery, and another Easy Wallstent was placed in the left common carotid artery. Post-dilation with a percutaneous transluminal angioplasty balloon for the left stent is also illustrated. This radiograph shows that all the supra-aortic stents are properly dilated. C, Arch aortogram obtained immediately after all procedures. Sufficient antegrade blood flow is noted in all treated vessels. The distal portion of the right subclavian artery is opacified via the cervical collateral vessels. The symptoms disappeared immediately after the first treatment, and the patient returned to her daily life activities. During the follow-up period, she experienced neck pain with C-reactive protein elevation, which represented active inflammation and required a transient increase in prednisolone dose during the 5th and 18th postoperative months. However, the follow-up angiograms obtained 1 and 2 years after the treatment showed no restenosis (Fig 4). Follow-up angiogram obtained 2 years after treatment shows no restenosis. Takayasu arteritis is an inflammatory disease of unknown origin that affects the aorta and its large branches. Progressive intimal fibrocellular thickening with elastic degeneration of the tunica media can lead to stenosis, occlusion, and/or aneurysmal dilatation of the affected vessels (1). Supra-aortic branches, such as the carotid, subclavian, and innominate arteries, are frequently involved. Consequently, the triad of this disease consists of absent radial pulse, ischemic retinopathy, and carotid sinus hyperreflexia that leads to fainting attacks. Other neurologic deficits can also result from cerebral ischemia. Takayasu arteritis most commonly affects women of reproductive age (15–45 years); therefore, the above-mentioned symptoms in young women are highly suggestive of this arteritis. The diagnosis can be confirmed by angiography, which shows the specific pattern of stenosis, occlusion, irregularity, and aneurysm involving multiple proximal branches of the aorta. The treatment of this disease is challenging. Although corticosteroids have been widely used to control the inflammation, revascularization must be considered when the symptoms become resistant to medication. Many surgical techniques have been reported, but they carry high morbidity and mortality rates and are associated with problems of stenosis or aneurysm formation on the anastomotic points (4). During the last decade, balloon percutaneous transluminal angioplasty has emerged as a viable alternative to surgery, with a low complication rate. However, post-percutaneous transluminal angioplasty restenosis in association with Takayasu arteritis has been reported to occur much more frequently than in association with atherosclerotic diseases, particularly in diffuse and long stenotic lesions (2, 3). In recent days, stent placement has rapidly gained acceptance for the treatment of atherosclerotic carotid and subclavian stenosis (5, 6). Stent-supported angioplasty is expected to have a lower rate of restenosis than simple percutaneous transluminal angioplasty. In cases of Takayasu arteritis, however, stenting for these supra-aortic vessels, especially for the carotid lesions, has rarely been documented despite more frequent use of this technique in the abdominal/thoracic aorta and its major branches since 1994 (7–9). Several authors have reported using subclavian stenting in cases of Takayasu arteritis (3, 6, 8), but attempts at carotid stenting have been reported by only two institutions (8, 10, 11) and the medium- to long-term prognosis has not been described, although one of these reports contains the short-term outcome (11). Multi-staged treatment for Takayasu arteritis involving all the major vessels, as reported herein, has never been described. It is, of course, somewhat controversial regarding whether all the lesions should have been treated. In this case, however, we think that bilateral common carotid artery stenting was reasonable because the patient had been suffering from severe carotid sinus hyperreflexia and ischemic retinopathy. We also think that left subclavian stenting was reasonable because the right internal carotid artery was occluded and the left vertebral artery was functioning as the main collateral pathway to the right cerebral hemisphere, which must be preserved throughout life. Although the inflammation relapsed twice, no restenosis occurred during a 2-year follow-up period. This may have been because of the effects of predonisolone. However, considering the rapid progression of stenosis observed before intravascular treatment, it is highly possible that the stents have been preventing re-narrowing of the vascular lumina. More cases are needed to confirm the effectiveness of this therapy. However, based on our experience, multiple stenting should be considered the treatment of choice for advanced supra-aortic lesions in cases of Takayasu arteritis. We thank Dr. Hiroaki Shimokawa for permission to use of the angiogram that was obtained 1 year before intravascular treatment and for assistance in follow-up of this patient. Accepted after revision October 1, 2001.